Are Wings easy to fly? One you get the launch down they are easy to fly. Just make sure you color the top and bottom differently because orientation can be a little hard. I think I included the plans for the arrow. It is a super easy build 2 sheet of foam board. It really doesn't matter what you build first. They are just foam board and can be easily replaced. Just make sure on the kits I gave you to trace out the parts so you can have copies. Just build something and fly. You will learn as you go along. Find out what works and what doesn't. I have been flying for 5+ years now and I still do that. This is my current project I am about to start working on. 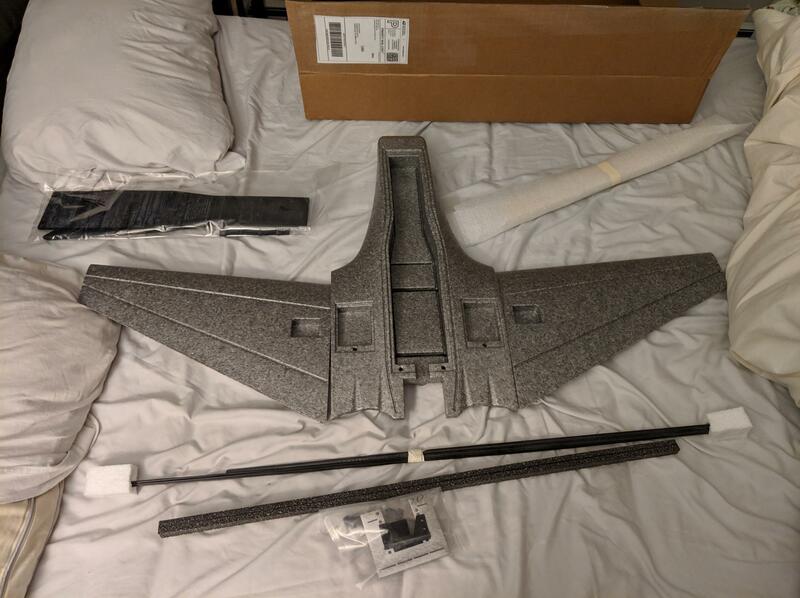 Ritewing Mini Drak. Ok. You gave me plans for the FT spear and then some other sport plane. Thanks for the advice! Since I am still really new to the hobby, I want to build the plane that is the easiest to fly, I don't want to have a bad experience. Were do you get all your foam board? That is a really cool plane you are work on! Are Wings easy to fly? [/QUO well, ish. All of the wings I have had have been sketchy apart from my ZOHD dart which has a gyro and safe built in. Wings are good if you know how to fly. If you are a beginner, you probably need to save both of those kits for later. Are you planning on trying to teach yourself without an instructor? (An instructor is HIGHLY recommended). In either case, if you are a new pilot, you should stick to the Tiny Trainer or the Simple Soarer. The FT Flyer is another option. It will teach you control and perspective. If you can learn to keep the Flyer in the air, you will gain the experience and confidence you need to progress. I'm not the kind of beginner that has never flown a plane before. I have been flying my WLtoys Cessna 182 for about a month so have already learned a few basic tricks. OK. I took a look at that thing. It's obviously toy quality, but it appears to be a "real" 3-channel plane that you have to fly without stabilization. Congrats! If you can keep it in the air, you're are doing well. I would proceed to the Tiny Trainer. You can start with the glider wing to continue, and quickly move on to the sport wing. Once you get used to ailerons, you'll be ready for most of the FT planes, including your Mini Mustang and Mini Guinea. Why would I go to the Tiny Trainer if I already know how to fly? To teach you the use of ailerons. Still would say do the cub! I would build the Scout next. It flies much better than the cub. That was really good. Did you learn on a simulator? Now that you know what I have to work with, what do you think I should do? I still suggest you scratch build a Versa wing with a power pod underneath and the propeller in front. This is known as a tractor configuration. It's a sweet flying plane, easy to launch for a wing, and durable in a crash. Also very easy to build. You can make a few different powerpods with the electronics you have and get a couple different flying experiences out of one wing. Tiny Trainer does everything the other FT designs do and can go full vertical/acro BUT it’s modular design and removable wing mean it survives the inevitable crashes better than some of the other designs. Just because it’s calked a Trainer doesn’t mean it’s deliberately lame or slow, it’s just designed to be easier to start on and repair, with the flexibility to grow with you until you are ready for a more specialised airframe. Trust me that thing can really move, it’s not some slow flying shed! If you accept you are going to crash it and don’t mind that then there’s no reason you couldn’t fly it, based on having flown the trainer you already own. You have some flight experience, keep flying the plane you have as much as possible to prepare for your new plane. Run the Mustang ailerons on very low rates and 40% expo when you first fly it. It will also feel very fast compared to your trainer! With that in mind the actual process of building the kit is easily within your skill set, it should be fun provided you accept it won’t last as long as the tamer options presented by my learned friends above. Worst case scenario you learn about building a kit and the perils of more advanced flying without spending any money then you can save for the parts needed for something tamer or repair the P51. Look Guys, @FDS is right, I am looking for the cheapest way to stay in the hobby, Not the easiest plane in the world to fly. @FDS, I acutely found two 1806 2200kv motors, one 12a and one 20A ECS and then I have to transmitter and receiver already. Wouldn't the Mini guinea be easier to fly than the mini mustang? I would only have to buy the Battery and a few connectors. I can use a 12a esc on one side and a 20a esc on the other, right? Mini guinea has a higher wing and in theory is more forgiving as a result, but you are adding potential complexity since you need one motor and prop CCW (counter clockwise) and one CW (Clockwise.) You can wire the motors to run like that but if there’s a CW thread on both prop nuts you will have to thread lock the CW rotating motor so it doesn’t undo in flight and shed the prop. You will also need to make a Y lead to link the two ESC’s to the battery, which will need connectors and 1*6awg silicone insulated wire. You will want a battery connector, male, then two sets of other connectors to join the ESC’s to the same battery. I think I can handle it. I would rather have it harder to build and be able to fly it than have it easy to build and not be able to fly. Good luck with it, keep us informed. I had lots of help from here in doing exactly what you are, moving from a pre built simpler trainer to a full 4ch and it made all the difference. The big Guinea is on my build list. Thanks! Yeah, I planning to start a thread about it and make a video for my YouTube Channel. my YT name is CrazyFastFlying. Tiny Trainer does everything the other FT designs do and can go full vertical/acro BUT it’s modular design and removable wing mean it survives the inevitable crashes better than some of the other designs. Just because it’s calked a Trainer doesn’t mean it’s deliberately lame or slow, it’s just designed to be easier to start on and repair, with the flexibility to grow with you until you are ready for a more specialised airframe. This is very true. When I was younger, I had a lot of prejudice and bias against the word "trainer". I hated it. Now, I delight in wringing a trainer out and showing off its capabilities. Good luck with the Mini Guinea!